Stern Pinball’s Official Aerosmith Pinball Machine comes to the UK! As you may have heard, the ringing in of the new year saw another big announcement from Stern Pinball. Following last year’s January 4th unveiling of the Spider-Man Vault Edition, this year’s offering confirmed a brand new theme that’s only been at the centre of speculation for months now. That’s right: adding a fifth family member to their classic rock band lineup, Stern finally unveiled the long-awaited, widely rumoured, official Aerosmith pinball machine. And while it may not have been a huge surprise, it certainly did not disappoint. Following the success of other musical machines, talk of an Aerosmith game began a couple of years ago when some concept artwork appeared online—and looking at Stern’s releases over the last few years, it’s not hard to see why so many pinball pros were convinced it was the real deal. With the likes of AC/DC, The Rolling Stones, Metallica and most recently, KISS, boasting pinball machines in their honour, it was really only a matter of time before “America’s Greatest Rock and Roll Band” would take to the playfield. Since their formation in 1970, Aerosmith have shredded their way through sellout shows all over the globe to become one of the most iconic stadium rock bands of all time; quickly gaining a reputation not only for their powerful rock-blues fusion sounds but also their uncompromising attitude and high-energy live performances. With a career spanning four decades and worldwide album sales of over 150 million, the band are still going strong and currently preparing for the European leg of their ‘Farewell’ Tour. A tour that, according to Steve Tyler, could potentially last “forever”. No signs of slowing down yet then! Appearance-wise, the new Aerosmith pinball machine almost echoes the Batman 66 with a large full-colour LCD screen taking pride of place in the lower half of the backbox. And thanks to the new SPIKE-2 electronic system, players can look forward not only to innovative animation, but HD visuals as well. The game also includes custom speech from Brendon Small, creator of the animated TV series, Metalocalypse, which centres around a somewhat flamboyant death metal band. On the outside, each model features its own unique art package hand-drawn by renowned rock artist ‘Dirty Donny’ Gillies—the illustrator’s second pinball project following his work on Stern’s Metallica machine back in 2013. Designed by Stern’s own John Borg, the game itself sports some familiar features including Jacky’s 3D mechanical ball locking toy box, ramped up to release no less than six balls for a super intense multiball mode. The rest of the playfield is packed with the typical trademarks we’ve come to expect from Stern in recent years, including a full LED light display, illuminating spotlights, an array of targets and 3-channel stereo sound. Components unique to the game include the ‘Sneak In’ skill shot, ‘Crank It Up’ ball scoop, a ‘Rats In The Cellar’ spinner to help you rack up some extra points and even a colour-changing RGB topper which will really stand out in a home games room. Get a taste for the rock star life as you embark on your very own stadium tour experience, playing as the band and unlocking different features as you progress—all to the soundtrack of some of Aerosmith’s biggest hits. Players and bystanders alike won’t be able to resist rocking out to the nine classic tunes blasting out over the concert arena playfield, scoring points and completing game objectives to raise the audience’s levels of energy, thrill and enjoyment. The higher the energy level, the bigger and louder the show and, ultimately, the more exhilarating the player experience. Like most other machines on the market, the Aerosmith pinball game is available in three different models: Pro (light blue), Premium (purple) and Limited Edition (dark blue). What really makes the latter two stand out from the Pro is that they also feature an upper playfield, complete with orbit lane, five standup targets and a special ‘Love in an Elevator’ moulded toy exit. Along with all of the usual special extras that come with the Limited Edition model, such as the signed authenticity certificate, autographed playfield and serialised number plate, owners of the LE will also have the privilege of knowing that their machine is one of only 500 produced. Still struggling to decide which one is for you? You can see the full breakdown of features for all three models here. And if you’re wondering about add-ons, Stern have already confirmed that a whole host of licensed accessories will be available, including toppers, laser cut armour, custom shooter knobs and perhaps most excitingly, a set of inner art blades to brighten up the black sides. If you’re ready to buy, Pinball Heaven are pleased to offer the official Aerosmith pinball machine for sale in the UK from Feburary/March. Whether it’s the Pro, Premium or Limited Edition model you’re after, you can preorder it right now by clicking here. Not your thing? You can browse our full range of games here and follow us on Twitter to find out the latest in pinball news and releases. Pinball Heaven At PLAY Expo in Manchester! 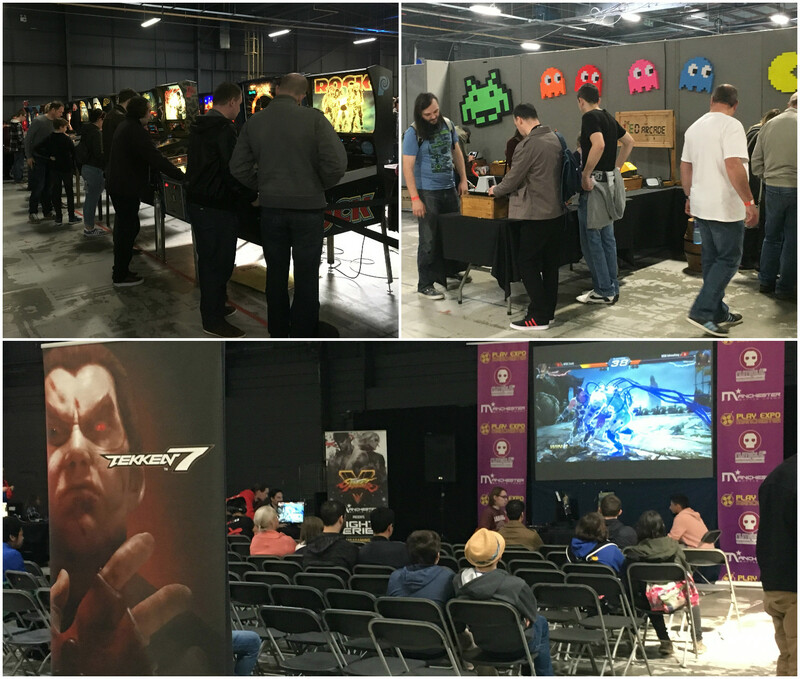 October has been a busy month for Pinball Heaven, kicking off with our display at the north’s biggest video gaming event: PLAY Expo at Manchester’s EventCity. The award-nominated show, which is now in its fifth year running, played host to hundreds of major exhibitors showcasing everything from virtual reality and next-gen gaming to indie developers and arcade games. 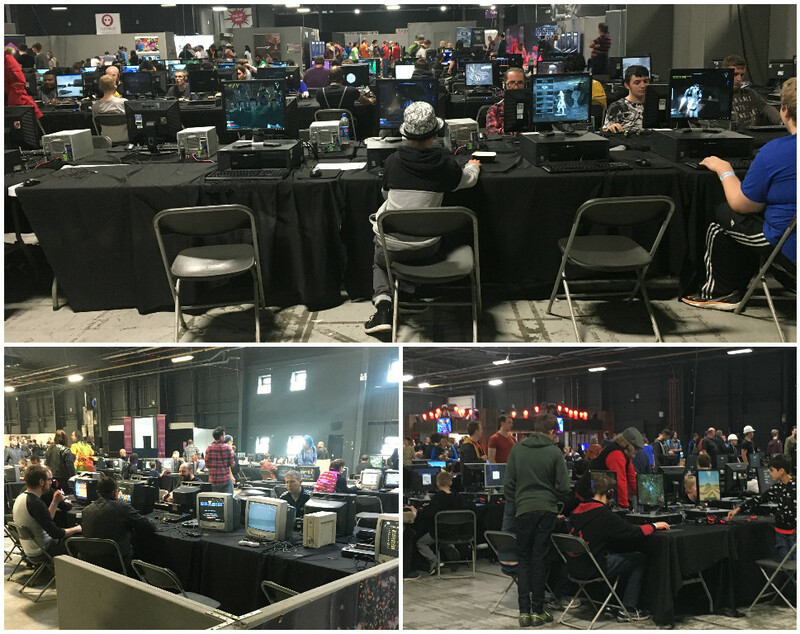 EventCity was transformed not only into a fantastic meeting place for gamers, but also into a serious battleground complete with competitions, tournaments and even the chance to beat the developers at their own games! 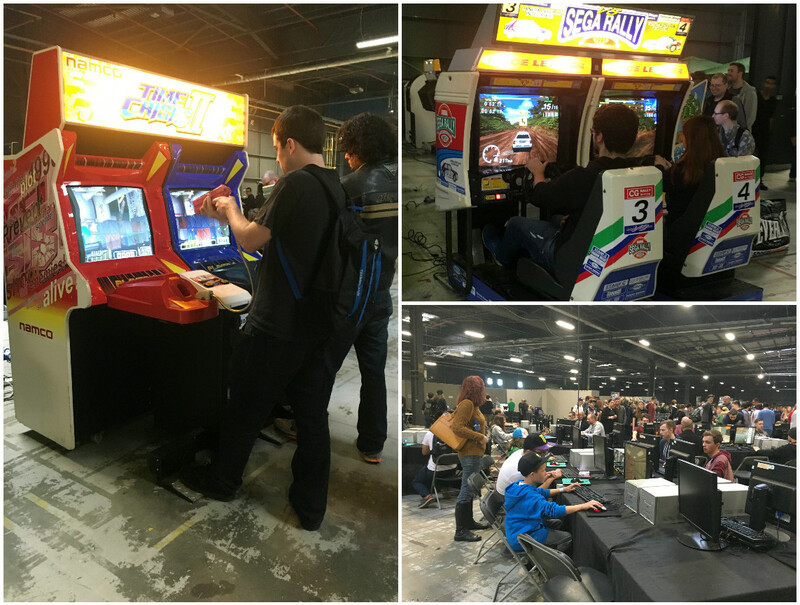 Although the event was a celebration of all things gaming and pop culture, the beating heart of PLAY Expo Manchester was undoubtedly the retro zone which featured a record-breaking display, including 13 of Pinball Heaven’s own machines. 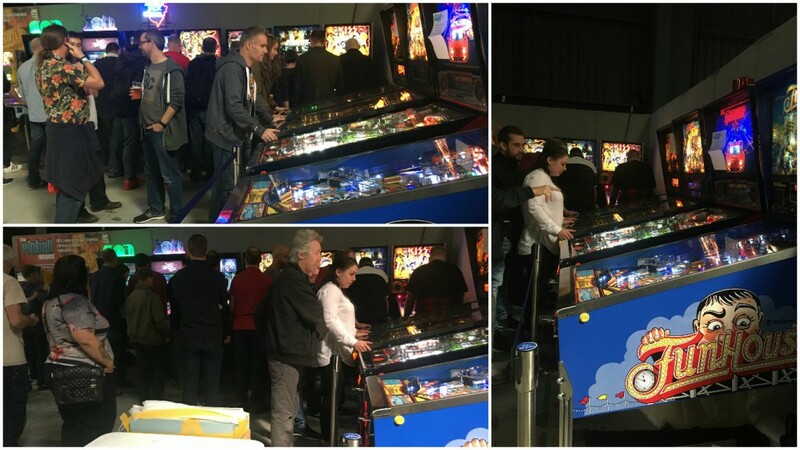 Visitors to PLAY Expo were given the chance not only to play, but also to connect with other collectors and fellow fanatics, buy new machines and mostly enjoy a great experience alongside other members of the UK pinball community. It is this community who helped to ensure that there was a range of over 100 pinball machines on display at the show. Spanning over 55 years from 1958 (Gottlieb’s Roto Pool) right up to 2016 (Stern’s Ghostbusters) both game supplied by Pinball Heaven, the wildly varying collection of old and new machines alike was enough to excite almost every pinball fan and allowed many attendees to relive their all-time favourite pinball moments once again. With over 300 playable consoles, computers and pinball machines, the show really did come alive with the retro gaming spirit and our corner of the Northern Lights Pinball Show had queues all weekend! 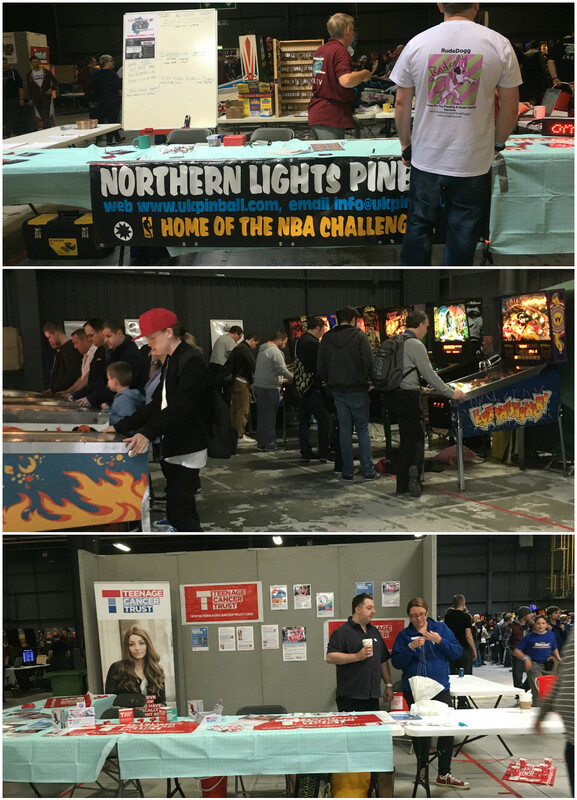 Thanks to almost 20,000 visitors, Northern Lights is now the largest pinball show in the UK and we loved being a part of it, showcasing some of our classic pinball machines and brand new games. Throughout both days, we saw a wide range of players from pinball collectors and seasoned pros to new and curious members of the general public who played pinball for the very first time at the show. All proceeds generated were donated directly to the Teenage Cancer Trust, who Northern Lights have been supporting since the show started back in 2011. Over the last five years, the show has managed to raise £15,000 in donations for the highly worthwhile charity and this year we were proud to help that total rise. Pinball aside, the retro zone at PLAY Expo was home to a gaming library of over 100 arcade machines for the weekend, as well as over 250 games from the last 25 years, including family favourites like Donkey Kong, Pacman and Super Mario Bros, as well as vintages classics such as Mortal Kombat, Asteroids and Space Invaders. Throw over 100 classic PC games into that mix and you’re looking at the biggest collection of retro games at any gaming show in Europe. There really was something for everyone, evidenced by the colourful variety of visitors. We saw members of Team Nintendo, Sega, Sony, EA and even Xbox! As if all of that weren’t enough, the event also played host to Tomb Raider’s 20th Anniversary celebration and a Sonic Super Sunday special in honour of Sonic the Hedgehog’s 25th birthday. Alongside seminars, interviews, live music and the official Northern UK qualifier of the Red Bull 5G eSports Tournament, a walk around the huge exhibition centre also showed us tabletop gaming, a dedicated Minecraft area, drawing masterclasses and even a cosplay masquerade! Dialed In Pinball Machine from Jersey Jack Pinball! NEW Dialed In Pinball Machine from Jersey Jack Pinball! There’s been talk of a collaboration between Jersey Jack Pinball and legendary pinball designer, Pat Lawlor, for a while now but the details have been kept top secret. Other than the fact that it would be based on an original concept, everything else has remained a mystery—until now. At the 32nd Annual Pinball Expo 2016 in Chicago, the brand new pinball machine, Dialed In, was finally revealed and it really does look like it was worth the wait. As all proud pinball owners will know, regular maintenance is important if you want to keep your classic pinball machines at their best; however, even with consistent cleaning and careful upkeep, there are a few occasions that even the most practised of players may be unprepared for. From broken flipper coils to flickering LEDs, we really have seen it all here at Pinball Heaven over our 26 years of repairing pinball machines—and it’s that experience which has caused us to create what we believe is the best pinball repair service in the UK. A faulty coil (or solenoid) is one of the most common reasons people phone us to ask for technical help and can even be the cause of a pinball machine breaking down. It can be as simple as a wire off but it can cause a major problem. Broken wires and faulty resistors aside, dry joints (broken solder) and even dirt can cause the Opto circuit on certain machines to flicker on and off, confusing the machine and making it do strange things. It’s easy to panic if you find that all of a sudden your pinball machine won’t even switch on. Often this is down to one of two things: a fuse has blown either in the plug or the internal mains, or the Euro power lead has become loose at the back of the machine. Usually, we can repair boards for modern games (from 1990 onwards) within 24 hours. We repair almost all Bally, Williams, Data East and Stern circuit boards on the same day—and if we can’t, we are more than happy to send a replacement board for your pinball machine. You can find out more about our pinball board repair service here. Or an email. Or an iMessage! We offer a free technical support service that you can access simply by getting in touch. As the most knowledgable pinball company in the UK, we’re pretty good at finding faults with pinball machines and can usually diagnose the problem remotely in a matter of minutes. Once we’ve worked out what the problem is, how you choose to solve it is completely up to you. If the solution is relatively simple, we can talk you through how to repair your pinball machine yourself over the phone. If it turns out you require replacement parts for your pinball machine, we can order and send these out to you. We have the largest stock of pinball parts in the UK. We are official distributors for many pinball parts manufacturers in the USA. 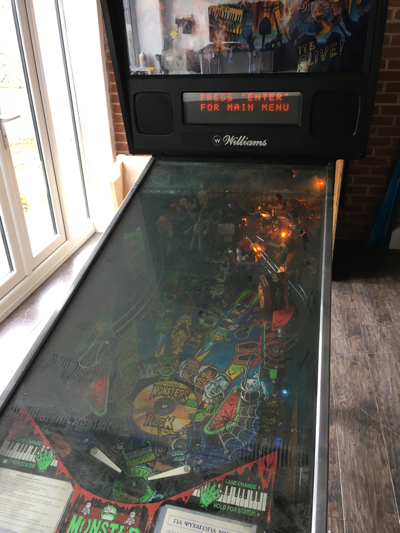 If you’d rather have total peace of mind, we can take the worry off your hands completely by arranging for a service engineer to come directly to your home or business as part of our onsite pinball repair service. We are based in Preston, Lancashire but regularly carry out pinball machine repairs in Manchester, Liverpool, Leeds, Birmingham, York and across the whole of the North of England. We’ve even repaired pinball machines as far South as Worcester, Bristol and Rugby—just contact us for availability. We really fix the games that no-one else can. So don’t waste your time elsewhere, we can fix it. Repairing, restoring and servicing pinball machines is what we do best. If you’d like to take advantage of our free technical support, you can contact us here. Please make sure to state the name of the machine, the apparent problem and any previously known problems. You may also wish to send an accompanying video clip to us and that really does help! You can find prices for our onsite pinball repair service here. 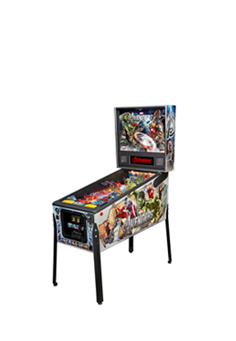 If you bought your machine from Pinball Heaven, you are covered by our 2 year warranty and then lifetime technical warranty and we will always help you to fix any problems with your machine. To keep up-to-date with all of the latest pinball news, follow us on Twitter. Pinball Expo 2016 in Chicago! It’s time once again for the annual Pinball Expo in Chicago and 2016 looks set to be the best year yet! To mark the 32nd year of the U.S. exposition, the event will be a celebration of all things pinball, featuring classic pinball machines for sale and to play from all eras alongside the latest in new technology. Attendees will be given the chance not only to play rare and brand new pinball machines, but also to meet fellow fanatics, buy pinball machine parts, brochures or even new machines, and really just soak up the atmosphere. The four day event, which is the world’s largest gathering of pinball industry and hobby celebrities, avid and casual collectors, will run from 12 – 16 October at the Westin North Shore hotel and is sure to offer something special for everyone. Alongside seminars, autograph signings, the ExpoBrawl and a Flip Out tournament, activities on offer also include a pinball art contest and an exclusive tour of the nearby Stern Pinball factory, allowing players to see the production of machines from beginning to end. While the late-night gaming is bound to be brilliant and the on-site pinball repair service is a very nice touch, it’s the pending announcements from some of the biggest names in pinball that have got us most excited. 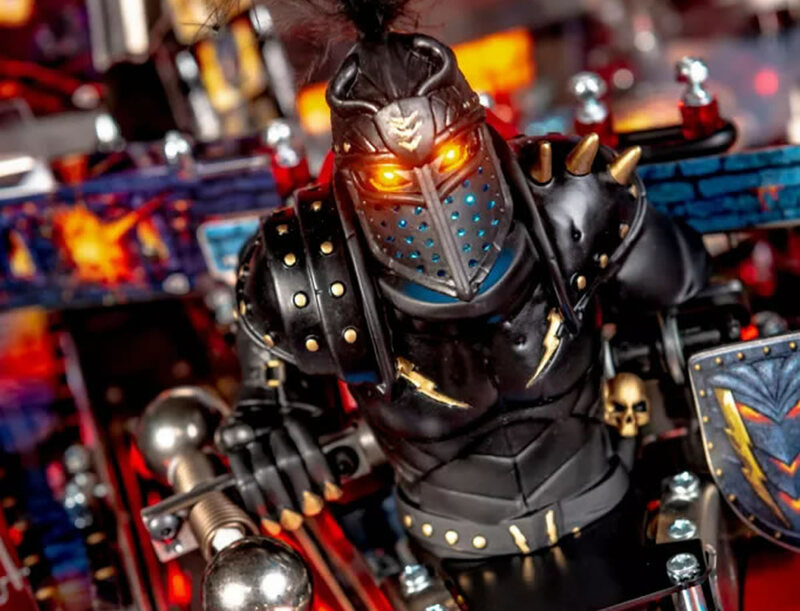 Taking everything—all exhibits, vendors and entertainment—into consideration, these three (predicted) big reveals are what we here at Pinball Heaven are most looking forward to. Although as yet unnamed, excitement is already building up for the highly-anticipated third release from Jersey Jack Pinball, designed by legendary 90s game designer Pat Lawlor. Following the major success of the Wizard of Oz pinball machine and The Hobbit pinball machine, it’s no surprise that this killer collaboration is continuing for a third round, with artist John Youssi, programmer Ted Estes and sound master Dave Thiel all on board. Unlike the first two games based on movies, the new machine will feature an original theme and if Pat’s track record is anything to go by, it’s likely to be something most unusual and unique. We know from this year’s Southern-Fried Game Expo that the game will not be a concept that Pat has done in the past so we are absolutely expecting the unexpected! As the exclusive distributor of Jersey Jack Pinball machines in the UK, we’ll be sharing all of the latest updates about the new game right here on Pinball Heaven. We may not know much about this one yet but the team behind the much-loved Medieval Madness Remake are expected to announce another remake at the expo. The 90s favourites Attack From Mars and Cactus Canyon pinball machines are both tipped as frontrunners for getting a new lease of life, but our money is on the highly sought-after 1996 classic Attack From Mars pinball machine being remade next. Whatever Chicago Gaming have up their sleeve, Pinball Heaven will be stocking the pinball machine exclusively as soon as it’s available for sale in the UK. So if you are looking to buy Attack from Mars pinball machine – start saving! As you may have heard already, Stern Pinball have announced a brand new pinball machine based on the classic 1966 Batman TV show as part of their 30th anniversary celebration. Although there’s no image of the Batman 66 pinball machine yet, a flyer detailing some of the features has been doing the rounds online and we have to say it looks pretty fantastic. Check it out below. Excluding the crane toy which is being lifted from their 2008 game, Batman: The Dark Knight, the machine will feature an all-new design and become the first Stern game to use a full-colour LCD display for both the backbox and the playfield, instead of the traditional single-colour dot-matrix display. Pinball designer George Gomez (known for Lord of the Rings and Monster Bash) and coder Lyman Sheats (known for Metallica and The Walking Dead) were both enlisted to help make the machine the best it could be—and expo attendees will be the first to see the results. This collaboration between Stern and KaPow Pinball celebrates not only Stern’s own anniversary but the 50th anniversary of the original Batman TV show as well. In honour of this, anyone who preorders one of the 240 Limited Edition machines will gain entry to a special VIP meet-and-greet with Adam West, a.k.a. the original Batman! The meet-and-greet will take place as part of Stern’s Epic 30th Anniversary Extravaganza party during the expo. Interestingly, there will be no Pro edition available, only Premium, Limited Edition and Super Limited Edition which can be purchased by invitation only. Ahead of the release in November, both the Premium and Limited Edition Batman 66 pinball machines can be preordered directly from Pinball Heaven with a £2000 deposit. See our full listing here. The list of sponsors helping to make the Pinball Expo possible includes Stern Pinball, Pinball Mike, Jersey Jack Pinball, Marco Specialities and the Make-A-Wish Foundation, which attendees will have the chance to give back to at a charity auction during a banquet on Saturday night. Itching to buy tickets yet?! Whether you make it to the big event or not, it’s certainly set to be an exciting year for pinball collectors. If you’re looking to add to your own collection, check out our current range of pinball machines for sale in the UK here. To keep up-to-date with the latest pinball news, follow us on Twitter. Pinball Heaven comes to the Ideal Home Show in London and Manchester this Christmas all in aid of the Katie Piper Foundation. After an initial and very successful run at the Ideal Home Show back in March, we are pleased to announce that Pinball Heaven will also be donating pinball machines for the Ideal Home Show at Christmas this November in both Manchester, Event City and London Olympia. The Ideal Home Show is the UK’s premier interior design event, showcasing everything from home improvements to smart technology—and the Christmas edition is just as jam-packed, bringing everything you need to prepare your home for the festive season, will that special someone get a Pinball Machine for Christmas this year? The exhibition will not only be setting up in its traditional location at London’s Olympia from 23 – 27 November, but also taking over EventCity in Manchester from 10 – 13 November. We will be bringing along and will have for sale both our Ghostbusters pinball machine and The Hobbit pinball machine to London and Manchester, giving you the chance to trial two of our bestselling games—a fantastic opportunity if you’ve been thinking if you should buy a pinball machine for Christmas. Read a little more information about them below. Travel back to the ‘80s with this vibrant, retro machine based on the classic film. Featuring the hit theme song by Ray Parker Jr., beautiful hand drawn artwork by renowned illustrator Jeremy Packer a.k.a. Zombie Yeti and custom narration from none other than Ernie Hudson — the original Winston Zeddemore — the game is specifically designed to be easy to play but difficult to master. Available for sale here. A real standout from other pinball machines, The Hobbit features a lively, animated LCD screen playing CGI scenes, animations and movie clips from Peter Jackson’s latest trilogy. While this is certainly the most striking element, there are a whole host of other cool toys, targets, ramps and surprises unique to the game that really do need to be seen to be believed. Available for sale here. All proceeds from play will go directly to the Ideal Home Show’s charity partner, the Katie Piper Foundation, who work tirelessly to support people with burns and scars. After raising over £200 for the foundation at our first show earlier this year, we’re hoping to bump that total up even more in the run up to Christmas. You can find more information about the Katie Piper Foundation here. A key focus of Pinball Heaven is to promote pinball culture to a wider audience and we couldn’t think of a better way to do it than to showcase our pinball machines at one of the UK’s busiest exhibition venues. Thinking about coming along to London or Manchester? You can find more information about the Ideal Home Show at Christmas here. If you want to get your Christmas shopping done early, you can also see our full range of pinball machines for sale here. To keep up-to-date with the latest pinball news, be sure to follow Pinball Heaven on Twitter. Ultimate Home Pinball Arcade & Games Room! Have you ever dreamt of having your own home games room? Well, this is what it could look like! Check out this amazing private pinball collection belonging to one of our customers, complete with a total of 18 pinball machines. On one side of the room you’ll spot the ‘90s classics: Attack From Mars, Champion Pub, Cirqus Voltaire, Tales of the Arabian Nights, Bride of Pinbot, Fish Tales and White Water. On the other side, the latest Limited Edition family favourites: Star Trek Limited Edition by Stern, The Hobbit Smaug Edition, Ghostbusters Limited Edition, Walking Dead Limited Edition, Transformers Limited Edition and the Medieval Madness Remake—almost all of which are now available for sale on our pinball machines for sale page. Our customer built his games room in 2013, opting for oak flooring, feature brick walls and even including a cinema! 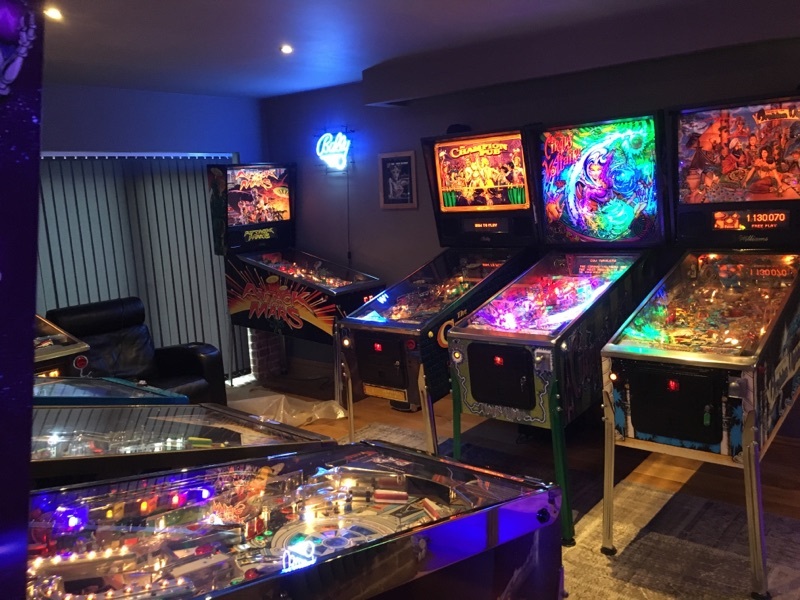 Initially the space was used to house a pool table, poker machine and a few arcade games, but after buying a couple of pinball machines from Pinball Heaven, he was surprised at just how much his family enjoyed them. Out went the pool table and in came more machines! But as our customer assures us, the collection hasn’t stopped growing yet, and we can’t wait to see what it looks like in another three years. Feeling inspired yet? If you’re thinking of building your own home games room, here are three important things to consider. To get the most enjoyment out of your home games room, you’ll probably want to share it with your friends and family; offering a variety of different games for different people will keep everyone coming back for more. Appeal to the old-timers with vintage classics like Funhouse and Monster Bash, while keeping the millennial TV lovers on their toes with Stern’s Game of Thrones and The Walking Dead or retro fans will love Ghostbusters and Wizard of Oz! If you feel like branching out to build your collection, you may find that a lot of old arcade games lose their appeal rather quickly, especially if you’re playing on your own. One of the best things about pinball machines is that they are inherently random—a surefire way to keep things exciting and keep boredom at bay and can be enjoyed on your own or as part of a group of friends battling for the high score of the night! Pinball machines are never the same game twice unlike video games, pinball is easy to understand yet difficult to master. 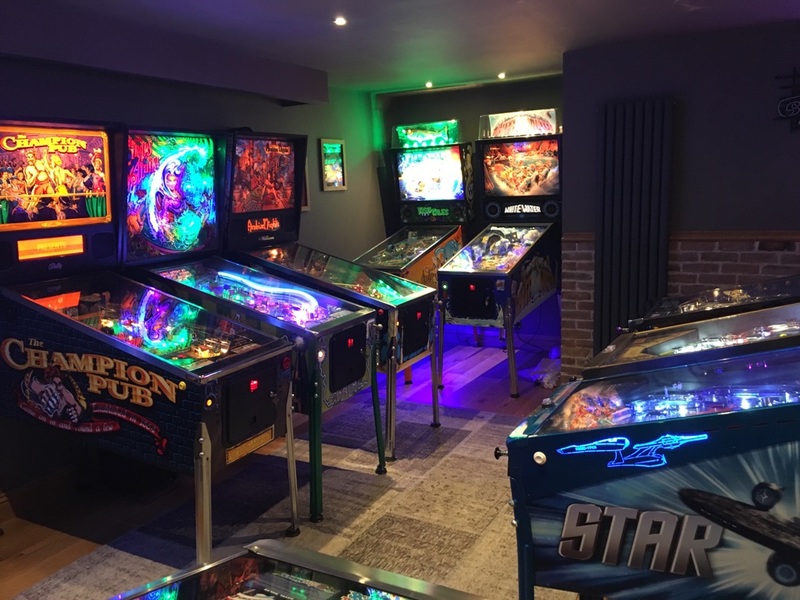 As your games room grows bigger, reliability also becomes increasingly important, which is why we offer assistance with the maintenance and upkeep of your collection. Our free technical support and onsite pinball repair service will help you to diagnose and solve any problems, saving you from technical headaches down the road. If you think you’re ready to take on the fun and exciting challenge of building the ultimate home games room, look no further than Pinball Heaven. With the largest stock of brand new games of any UK dealer and a 2 year onsite warranty with every purchase, we are undoubtedly one of the best sources in the UK for pinball collectors. Whether it’s your first pinball machine or your fifth, we’ll ensure you find the right machine for you. Get started right now by checking out our current pinball machines for sale, or if you’ve already got an awesome home pinball collection, make sure to send in photos for a chance to be featured on the blog. To keep up-to-date with the latest pinball news, be sure to follow Pinball Heaven on Twitter. 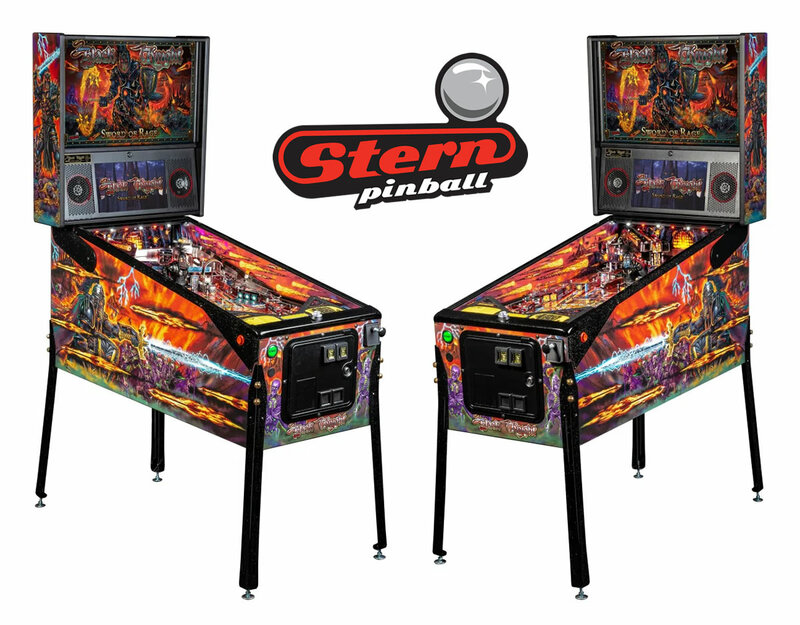 Stern Premium pinball machines for sale in the UK landing September. September is set to be an exciting month for Pinball Heaven with four new premium machines available from Stern. Which machine should you buy? 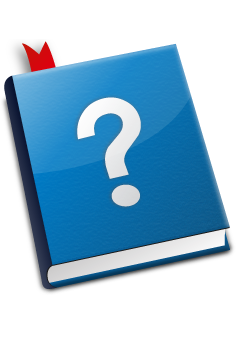 Let’s take a closer look at some of the individual features to help you decide. 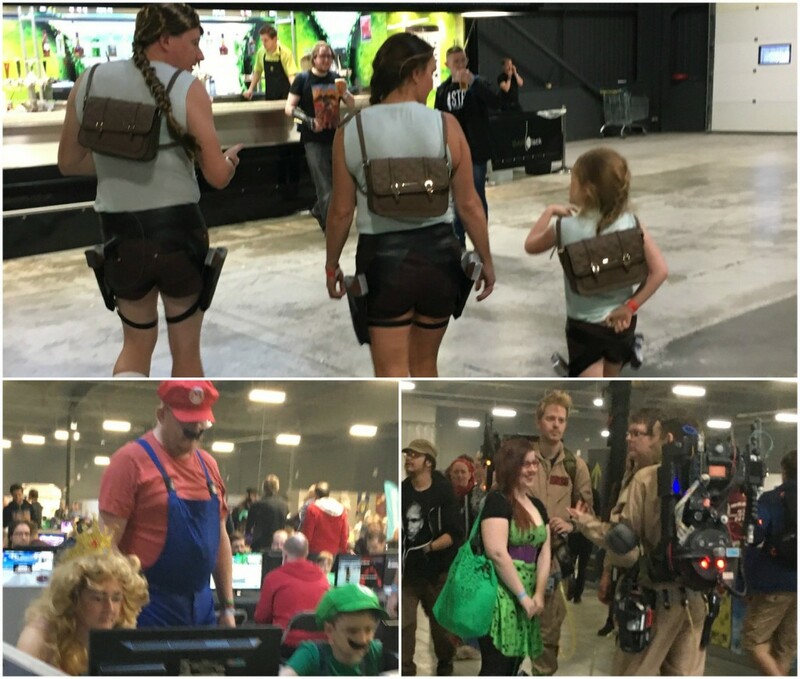 Whether you’re a ghost buster or a Trekkie, you certainly won’t be disappointed with the selection. Travel back to the ‘80s with this vibrant, retro machine based on the classic film. Featuring the hit theme song by Ray Parker Jr., beautiful hand drawn artwork by renowned illustrator Jeremy Packer a.k.a. Zombie Yeti and custom narration from none other than Ernie Hudson — the original Winston Zeddemore — the game is specifically designed to be easy to play but difficult to master. Along with a motorised and fully interactive target in the form of the notorious Slimer, players will also find a colour-changing Marshmallow Man toy, an interactive ghost hologram target with animations, “paranormal” magnetic action slingshots, distinctive ramp architecture and additional custom moulded toys. The exclusive layout features a magnetic diverter and scoring switches, uniting traditional pinball devices with unique multifunction two-way ramps. Also included is a modern take on a ball transfer target, two pop-up Scoleri Brothers rollover drop targets, a ball eject target and a captive ball target. See the full product features list here. 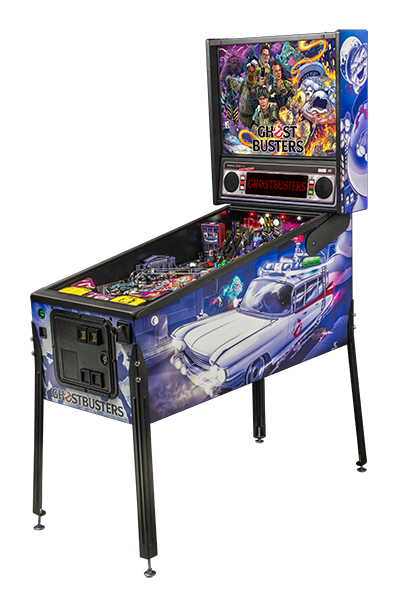 Following the recent reboot of the iconic series, Stern couldn’t have picked a better time to launch their Ghostbusters pinball machine. It may be all about Kristen Wiig and Melissa McCarthy in 2016, but who could forget the original 1984 lineup of Bill Murray as Peter Venkman, Dan Ackroyd as Raymond Statz, Harold Ramis as Egon Spengler and Ernie Hudson as Winston Zeddemore? 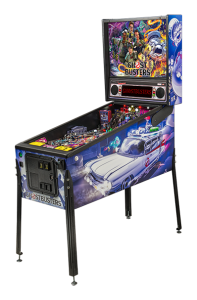 With the Limited Edition model selling out in just 12 hours worldwide, you won’t want to waste any time now that the Ghostbusters Premium Pinball Machine is available for sale in the UK. If you think this might be the pinball machine for you, you’re in the right place—Pinball Heaven is the only UK supplier to have stock! See our listing here. Stern’s collection of iconic rock and roll machines is growing, and the latest addition honours one of the world’s most influential rock bands. A must-have for heavy metal fans, the premium edition of the machine features art by Metallica’s choice artist, Dirty Donny, and a soundtrack of 12 Metallica songs—all performed by the band themselves. Players will be able to bang both their heads and their flippers to classic Metallica hits including “Master of Puppets,” “Fuel,” “One” and “Fade to Black”, setting the tone for an exciting in-game experience. The band’s famously fast tempos and aggressive musicianship provide the perfect accompaniment to an action-packed game with unparalleled magnetic activity. The Metallica Premium playfield is loaded with unique features including a 3 drop target inline bank, a captive ball assembly, stainless steel and wire ramps, plus a special custom moulded electric chair, snake & grave marker. See the full product features list here. Formed in Los Angeles back in 1981, Metallica have been making iconic metal music for over three decades. What better way to celebrate their greatest hits than with this awesome machine? 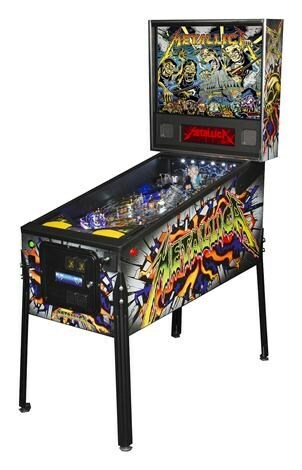 If you’re ready to rock your way to a new high score, Pinball Heaven is the only supplier with stock of the Metallica Premium Pinball Machine for sale in the UK. Available to order here. Calling all zombie fans! 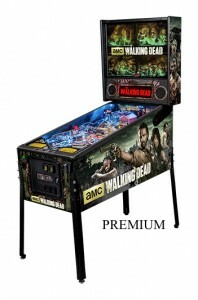 Complete with a new high-definition art package, gory dot matrix animations and an authentic soundtrack, The Walking Dead Premium Pinball Machine is full of gruesome features. Players will find themselves fighting to survive the zombie apocalypse alongside series icon, Sheriff Rick Grimes. Set to The Walking Dead’s original score, the game includes multiple zombie toys and features familiar locations used on the show, such as the Prison and Cell Block C. Players will be given the chance to defeat Prison Walkers, collect supplies, complete various game missions and play action-packed modes that are sure to heighten the excitement. The machine presents everything fans of the show would want in a flesh-eating pinball experience, including a special-effect fish tank with illuminated sculpted zombie heads, a player-controlled motorised crossbow pinball launcher and a whole host of additional targets for adrenaline-filled battles. Watch out for the Well Walker! See the full features list here. Holding the title of the most watched series among adults aged 18-49, AMC’s The Walking Dead is based on a comic book series written by Robert Kirkman, Tony Moore and Charlie Adlard. The drama stars Andrew Lincoln as Rick Grimes, Steven Yeun as Glenn Rhee, Norman Reedus as Daryl Dixon and Melissa McBride as Carol Peletier, and tells the story of the months and years following a zombie apocalypse. Whether you’re a fan of The Walking Dead or simply a fan of gore and zombies, then this is the machine for you. 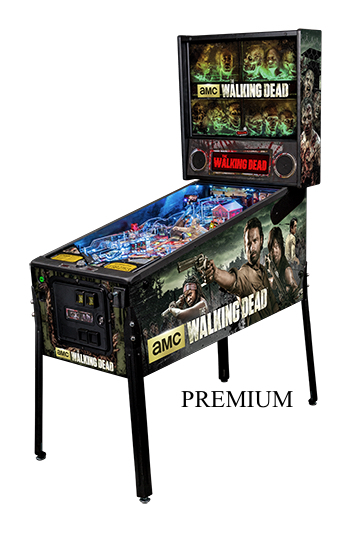 The Walking Dead Premium Pinball Machine is now available in the UK and for sale here on Pinball Heaven, one of the only UK stockists. See our listing here. Take a seat in Captain Kirk’s chair with Stern’s first all-LED pinball machine. 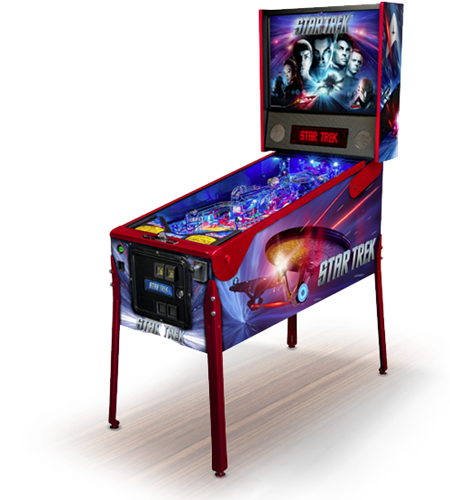 Inspired by the Star Trek and Star Trek Into Darkness films, the Star Trek Premium Pinball Machine features all the bells and whistles a Trekkie could ask for, mapping out the classic battle between the heroic Enterprise team and the villainous Khan, as well as run-ins with Nero, Klingons and the Narada. The game includes an animated battleship, three lightning fast ramps, three flippers, resettable memory drop targets and captivating effects such as phaser flashes and photon torpedoes. Thanks to the high-definition artwork, cosmic LED lighting, classic musical scores and custom voice callouts from Dr. Leonard “Bones” McCoy (Karl Urban), players will feel like they are flying through space at warp speed to rescue Spock and defeat the U.S.S. Vengeance. The play field features seven multicoloured LED paths that lead gamers on fast and fluid colour-coded routes, complete with six missions for casual players and 18 complex treks to immerse enthusiast players deeper in the game. From the very start, players will have the chance to unlock special opportunities, collect bonus features and win a series of accolades called ‘The Captain’s Chair’. See the full features list here. If you think you’re ready to embark on a journey to protect and defend the planets of the Federation, this is definitely the game for you. The Star Trek Premium Pinball Machine is almost out of production and unlikely to be run again, meaning Pinball Heaven has some of the very last few for sale in the UK. See our full listing here. Found your perfect pinball match? Find our full range here. Pinball Heaven has the largest stock of brand new games of any UK dealer. With our unique 2-year warranty, you can rest assured that your experience will be worry-free—even after the warranty has expired, you will still have access to our lifetime technical support package on your pinball machine. To keep up-to-date with the latest pinball machines for sale, be sure to follow Pinball Heaven on Twitter. 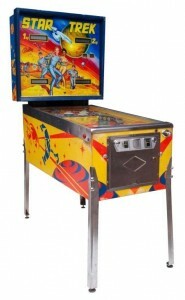 We love restoring and repairing pinball machines, nothing is better than taking an unloved and neglected pinball machine and making it look and play like new again, it is our passion for supplying quality refurbished pinball machines that has given us a reputation for being the best place to buy a pinball machine in the UK from. Something we are very proud of! So lets take a look at what we are working on at the moment. Bally Star Trek pinball machine, this classic machine based on the original series was first made by Bally in 1979 but has spent its life in Bar’s, Amusements Arcades and such like, now at nearly 40 years old it needs a refurb! We will replace the playfield and plastic set for a new one from Classic Arcades in Canada (for whom we are a distributor) and the cabinet will be restored using stencils just as it was originally. 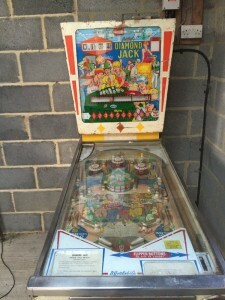 Diamond Jack by Gottlieb. This 1967 true classic is the add-a-ball version of King of Diamonds (but gives added balls rather than free games). Just 600 of these were made and how many do you think still exist? A handful. So when this came up for sale, it had to be done. Look at the sorry state its in as we bought it, since then we have found a brand new playfield for this game, that must be even rarer than the game itself! Monster Bash pinball machine by Williams for sale (soon!). This is one of the modern classics, such a funny game with so many features. 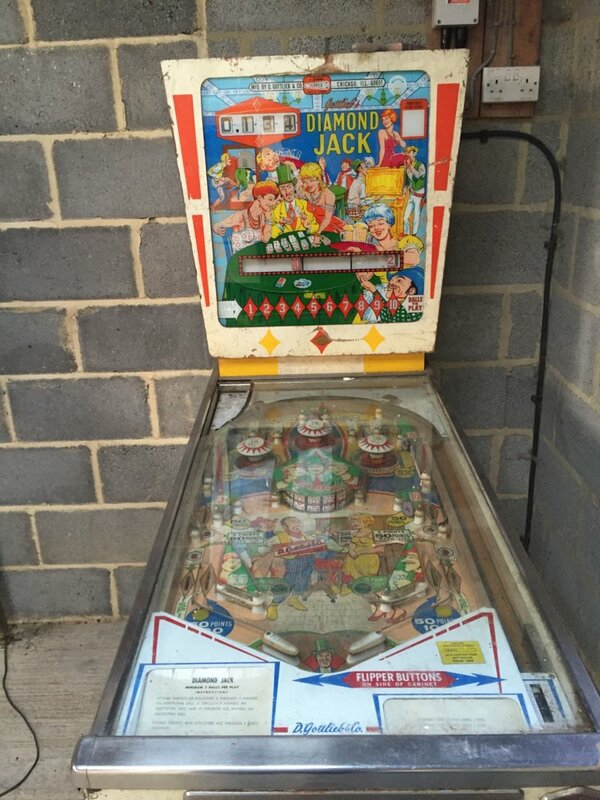 Unfortunately they suffer for their popularity as they are worn out when we see them, so thankfully, we are going to put a new playfield, plastic set, cabinet artwork set etc into this game and make it a beautiful fully restored pinball machine suitable for the finest of homes! This is what it looked like when it arrived. What’s new on the Hobbit Pinball Machine? With The Hobbit Pinball Machine having just been released, we thought we would celebrate our status as the sole UK distributor for Jersey Jack Pinball Machines with a blog about what makes this game outstanding. Jack Guarnieri, founder of Jersey Jack Pinball, is already a celebrity within the pinball community and the recent release of The Hobbit Pinball Machine is only going to cement his legendary status. His creativity and passion for pinball is almost single-handedly bringing pinball up to date. 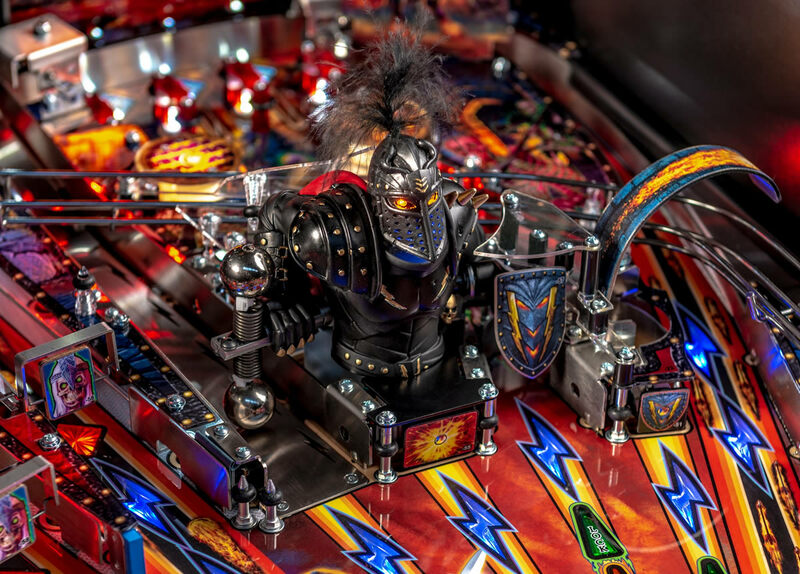 At a time when many people had written pinball off as a dying hobby, The Hobbit is helping to bring pinball to a brand new audience with the introduction of far superior technology. The Hobbit pinball machine boasts 2 lcd screens bringing 21st century video game-like graphics to this classic arcade genre. The backglass of The Hobbit Pinball Machine is a 27” full hd, lcd monitor which helps to provide a much more in-depth story line. The screen has been described as an information station and basically guides players through the game. Of course, this screen will help to engage and teach people new to pinball how to play which is a boost to the pinball community worldwide. Uniquely, this screen shows you all the different modes that you are going to have to complete and contains 4 different quadrants to show you what is going on. The top right quadrant is a helpful map which shows you where you are within the game. The second screen is smaller but no less important. Set within the play field itself, this screen is a book (including turning pages) that tells you what you tasks you need to accomplish. Whilst these screens are the most innovative aspect of The Hobbit Pinball Machine, the team at Jersey Jack Pinball have managed to include a number of other exciting features making The Hobbit a pinball machine that you simply have to play to believe. We currently have The Hobbit Pinball Machine due in stock around the end of Summer in Standard/Limited Edition/Smaug Special Edition. Whether you want to look at pinball machines for sale or you simply want to talk to the most knowledgeable pinball machine experts in the UK, just get in touch as we are always happy to talk all things pinball! Is your pinball machine resetting when you hit the flippers? Its a common problem, you press the flippers together in a mad panic induced by multiball or some other frantic flipper action and boom, the lights go off and the pinball machine will reset itself, just like when you turn it on. The fault comes and goes but many factors affect it, line voltage, heat, load on your pinball machine but its a sign that the 5v power supply is failing. Have a look at our short video and see if you have the same problem, this is a very common on some Bally Williams Pinball Machines, games with more flippers suffer the worst, so Addams Family Pinball Machine, Twilight Zone, Indiana Jones but really ANY Bally Williams WPC system game can have this issue. The cause, the number 1 cause is all the 5v supply on the pinball machine failing, so you need to rebuild this (we sell a kit for this if you are good with a soldering iron) or replace parts.